Low-gain pedal offers “classic Dumble tones." 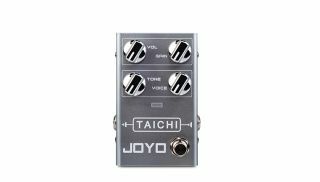 NAMM 2019: Joyo has added to their R series of pedals with the Taichi, a low-gain overdrive pedal that the company touts as capturing classic Dumble tones. The Taichi boasts volume, gain and tone controls, as well as a voice knob that controls the upper limit of total amount of gain and bass frequency response. There’s also an LED indicator and LED ambient lighting that can be synched to the footswitch, as well as a rear DC input. The Taichi is currently being offered for just $52.99. For more information, head over to Joyo Audio.